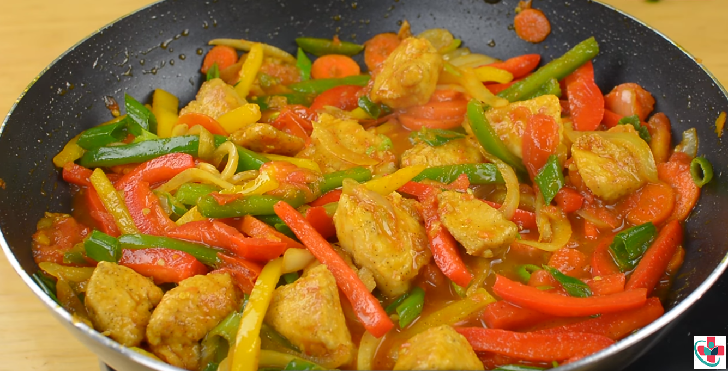 This is a very simple Chicken and Vegetable stir-fry recipe. It’s healthy, tasty and easy to put together and most of all, it’s a great way to make you and your family enjoy the benefits of Vegetables with less Meat. ➲Wash and cut all your vegetables and as well as the Chicken. ➲Add 3 Tablespoons of Cornstarch to your Chicken and season with Salt and Black pepper, mix together and set aside. ➲Preheat the Oil in a Pan and add the Chicken, cook and stir till it’s about 80% done, then add the Curry powder, Paprika, Garlic and the Carrots. ➲After about 30 to 40 seconds of stir-frying the Carrots, add the Habanero pepper and stir-fry as well. ➲Add all the other Vegetables except the Green Onions, add Salt, Pepper and Soy Sauce to taste. ➲Finally, stir in the Green Onion and remove from heat. ➲Serve with Rice, Pasta or whatever you are pleased with. Enjoy!